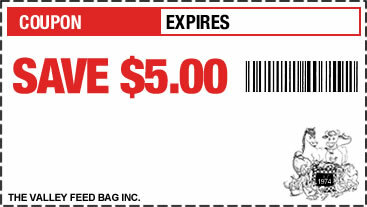 ::The Valley Feed Bag Inc.:: - Printable Coupons!! Valid at our Glasgow Avenue, Mission location only. One coupon per customer per purchase. Coupon is not valid in conjunction with any other current promotions for this product. Simply Print these Coupons out, clip them, and bring them into our store. The Valley Feed Bag Inc.